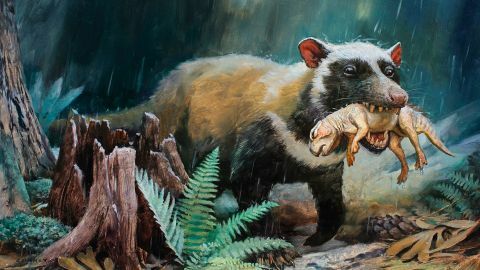 Review: In this short but sweet video, artist James Gurney shows how he brought a series of extinct mammals back to life for Scientific American. A short but informative video that shares plenty of useful knowledge in a down-to-earth way. The titular mammal that ate dinosaurs in James Gurney's new video is a repenomamus, a Cretaceous-period possum-like creature. A fossil of one such animal was found with the remains of a small dinosaur in its stomach and it's this interplay of mammals and dinosaurs that inspired a recent Scientific American magazine cover story, which James was asked to illustrate. Here he explains how to paint in his distinctive style. The creation of his natural history illustrations is territory that James has covered, sometimes in greater detail, in previous videos such as How I Paint Dinosaurs. But if this is your first Gurney video, you can look forward to a condensed yet detailed breakdown of his working methods, with plenty of ideas for you to bring into your own process. Key techniques include the creation of a head maquette (with dinosaur in mouth), which enables James to study the light and shadow across the forms more accurately. And the various thumbnails and studies he creates to give the magazine designers plenty of options. You'll also see moments when the process gets off-track and how James corrects it, like the point he realises he's worked too much detail into the background foliage. The knowledge on display is deep, yet presented in a down-to-earth way that makes you wish there was more here. The download is great value, the DVD edition less so – although making physical media and keeping the costs down is a challenge for any self-publisher. The 40-minute running time includes a three-minute bonus on protecting illustration boards from warping. James made and added this clip after feedback from an early customer, which just goes to show his commitment to sharing his knowledge with the art community. This article originally appeared in ImagineFX issue 140; subscribe today!